Hi-Vite Drops is a vitamin supplement for dogs and cats with liver and iron and is fortified with antioxidants. It is widely useful for cats and dogs that are deficient in essential vitamins. It is readily soluble in water, and hence we can mix it with food or milk. Nutrient supplements fill the gap made by lack of many essentials in the day to day diet of the pets. This supplement helps in eliminating any illness of discomfort by the animal due to lack of any vitamins. This supplement is suitable for aging pets. Hi-Vite Drops for cats and dogs is manufactured by and is a registered trademark of Vetoquinol USA. It is available only through licensed veterinarians. We can store the product Hi-Vite Drops for Cats and Dogs at room temperature. It contains antioxidants and other essential minerals that can be easily given directly by dropping it on to the tongue. It contains phosphorous, sodium, chloride, copper and niacin. Iron is essential for red blood cells which are present in Hi-Vite Drops for Cats and Dogs. Vitamin B group like thiamine, riboflavin, pyridoxine, cyanocobalamin, menadione is essential for the immune system. Vitamins A & E can help with the skin and hair fall. They also help in restoring any lost hair or dry skin. Vitamin D is for bone health. Vitamin K is vital for blood clotting, and lack or deficiency of the same can cause bleeding. Give dogs, cats, puppies, and kittens 1/2 dropper full (It is equal to 1/2 ml) twice daily. This mixture is water dispersible, and we can drop it directly on the tongue or can mix it with food or milk. Customers who have used this product on their pets have assured its effectiveness. They say it has helped eliminate the hair-ball vomit. It may irritate eyes and the ingestion’s in large quantities may have a laxative effect or allergies. Wash the skin areas which may have come in contact with the drops. You don’t have to keep it in the fridge or freezer. Make sure to keep it away from children. It is exclusively for animal use. In case of accidental ingestion or allergies immediately seek medical attention. The vitamin supplement boosts the pet’s heart, liver, and kidneys and increases the overall energy level of the pet. It helps the pet to have healthier skin or fur or coat and reduce the shedding. It strengthens the immune system of the animal. Overall Hi-Vite drops have received four stars out of 5. 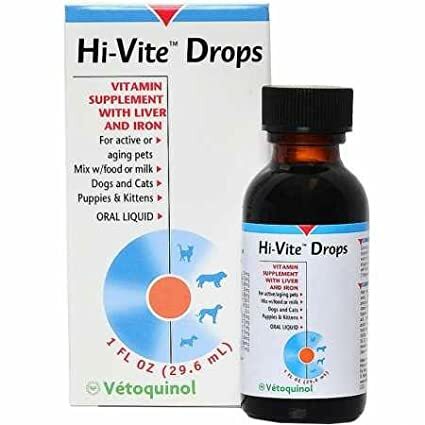 Further listed below are Hi-Vite drops (1 oz) for your reference. Do have a look.